SYNOPSIS: We all have a superhero inside us, it just takes a bit of magic to bring it out. In Billy Batson’s (Angel) case, by shouting out one word—SHAZAM!—this streetwise 14-year-old foster kid can turn into the adult Super Hero Shazam (Levi), courtesy of an ancient wizard. Still a kid at heart—inside a ripped, godlike body—Shazam revels in this adult version of himself by doing what any teen would do with superpowers: have fun with them! Can he fly? Does he have X-ray vision? Can he shoot lightning out of his hands? Can he skip his social studies test? Shazam sets out to test the limits of his abilities with the joyful recklessness of a child. But he’ll need to master these powers quickly in order to fight the deadly forces of evil controlled by Dr. Thaddeus Sivana (Strong)..
Freddy Freeman: [filming on his phone] You have bullet immunity! Shazam: [walking out of store with junk food] Sorry about your window... but you're welcome for not getting robbed! Freddy Freeman: Have a good night! Shazam: [to couple] Oh hey, wassup? I'm a superhero! One of the more popular names in superhero folklore has finally reached the big screen and is arguably the most lighthearted and fun DC film yet. My first reaction after seeing the trailers for this film was that it seemed quite silly. 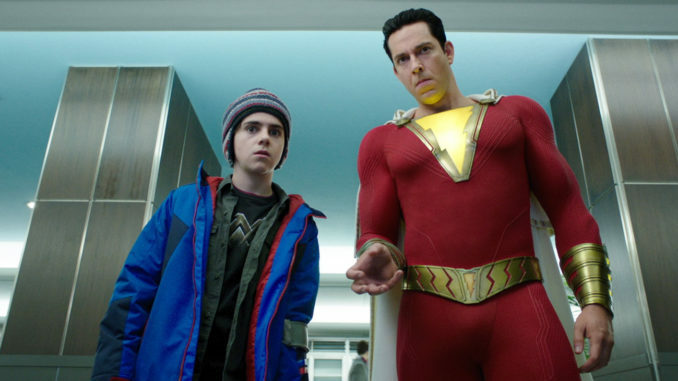 Then I was graciously schooled in the ways of Shazam and I learned that this is exactly what he is supposed to be, a young kid who is magically given super superhero powers out of the blue and his struggle with dealing with this gift in a mature way results in a silly, immature superhero. That is exactly what we get in this movie. Disclaimer, I’m not a big comic book guy but based on what I learned I would have to say that this presentation of Shazam is true to the comics. So yeah, we get the silly, we get lots of fun, and lots of funny too, some seriousness of course, a formidable villain, a sufficiently interesting origin story, and a very well developed focus on family and all its shapes and sizes. Family is the strong underlying story in this film and a driving force for a large part of the plot. It can be a heart-breaking letdown, an abusive prison, nothing more than a roof over our heads and a meal on a plate, or it can be a place of hope and unconditional love. Sometimes a family scenario can be the source of traumatic life experiences which can shape a person’s character for the rest of their lives. We get all this flavor in this one film.